A new health breakthrough has found a link between certain pesticides used to protect plant life—and Parkinson’s disease. Paraquat, maneb, and ziram are common chemicals sprayed in the U.S. (especially California) and have been tied to increases in Parkinson’s. This was not only among people who work on the farms, but in those who lived or worked nearby. Now we add another pesticide to the equation: benomyl. It has been a decade since the U.S. banned its use, but researchers have found its toxic effects still linger—and it, too, is linked to Parkinson’s. Researchers believe that exposure to benomyl triggers cellular changes that can pave the road to Parkinson’s. It stops one particular enzyme from trapping “DOPAL,” which is a natural toxin in our brains. Without that enzyme, DOPAL can build up, damage neurons, and raise the risk for Parkinson’s. This discovery could actually lead to positive developments: like whether protecting that enzyme could slow the progression of the disease in patients already diagnosed with Parkinson’s. Millions live with its symptoms, which include slow speech and movements, tremors, and rigidity. Researchers have found certain genetic links, but we’ve found that genetics is only a minor risk factor. So, they now believe environmental factors—like pesticides—play a big role in Parkinson’s. Benomyl was widely used in the U.S. for 30 years until we discovered a toxic link to liver cancer, brain malformations, and problems with the reproductive system. It was banned in 2001. 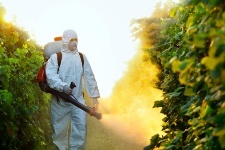 Still, the researchers wanted to explore the pesticide for potential long-term effects. Under the microscope, they confirmed that the pesticide damaged or destroyed neurons. They found this again in a fish model—the pesticide damaged important “dopaminergic” neurons, while leaving others untouched. This is big news, because until now, scientists have targeted one specific protein known to lead to Parkinson’s. But looking into this pesticide led us to an enzyme that gives us another target entirely to try and stop this disease. In truth, pesticides are very damaging, and the widespread use of them on U.S. crop fields is a mistake. This is just one disease that many studies have linked to being at higher rates among farmers and those living in rural areas (where the molecules could float in the air). While pesticides have been the enemy, the good news is that they could help lead to a cure. “Pesticides and Parkinson’s: UCLA researchers uncover further proof of a link,” UCLA, January 3, 2013.